You will never change the things in your life that you know are defective unless you learn the truth. 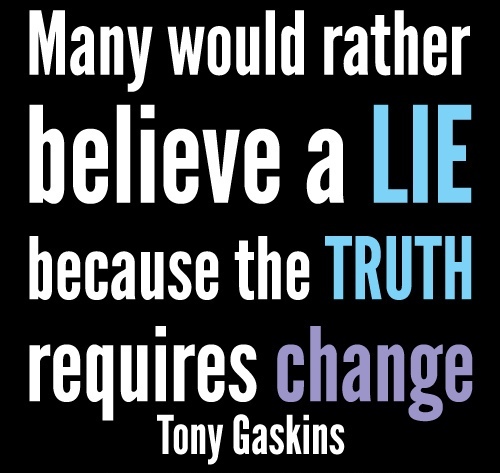 Change requires learning the truth. Jesus said, "And you will know the truth, and the truth will set you free" (John 8:32 NLT). You're not going to be free until you know the truth. The secret to personal change is not a pill, program, or process. It's not therapy, a book, or a seminar. It's not positive thinking or psychology. The proof of personal change is found in the truth. You have to know and face the truth about yourself, God, and your relationships before you can change. Behind every self-defeating behavior in your life is a lie you're believing. If you're deeply in debt right now, it's because you believed some lies. You thought, "I can just keep charging it forever and get away with it." Oh really? "I have to have this house." Oh really? Do you really have to have it? Is it true? Can you prove it? We lie to ourselves all the time. But you have to know and face the truth if you're going to change. Jesus said the truth will set you free. But first it makes you miserable! It makes you miserable as long as you deny it. The moment that you are honest with the truth about you and everything else in life, then it starts to set you free. Who is the truth? Jesus said, "I am the truth." Not "I have it." Not "I point the way." Not "I teach it." He said, "I'm it. I am the truth." The Bible is like a path. It shows us where to walk and how to stay on the path. It shows us when we get off the path and how to get back on the path. When you use God's Word to show you where and how you should walk, it will give you the instruction and knowledge you need to change your life.